Nilüfer Egrican has recevied her B.S. from Istanbul Technical University in 1970 and her Ph.D. from Universty of Maryland in 1977 both in Mechanical Engineering. She joined the faculty of University of Maryland in August 1977, teaching Thermodynamics and Heat Transfer. Her research areas are solar energy systems, heating, cooling, air conditioning and refrigaration. In 1979 she joined the faculty of Istanbul Technical University where was promoted as a Professor. 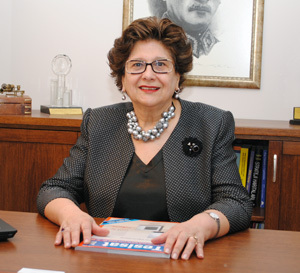 She has served as the Dean of School of Mechanical and Textile Engineering at Istanbul Technical University from 1994 to 2000. In 2002 she was transfered to Yeditepe University.She was the Vice President of Yeditepe University, responsible of acreditation of education, research and development and industrial relations until Nov.2010.Currently she is the President of Suntek International. Dr. Egrican also worked as a consultant for several private companies including Arcelik R&D Department (ongoing); Solar Energy Research Institute in Golden, Colorado, USA; International Center for Theoretical Physics in Trieste, Italy. Dr. Egrican is also a member of Istanbul Chamber of Industry, Committee of Quality and Technology (ISO-KATEK); National Innovation Initiative Group; Scientific Council of International Center of Applied Thermodynamics. She is a member of the Board of Trustees of Heating, Cooling, Air Conditioning Research and Education Foundation (ISKAV) and an honorary member of Air Conditioning and Refrıgration Manfacturers Association (ISKID) and of Cogeneration Association (COGEN). Dr. Egrican has served as the Vice President of ASME International Region XIII from 2003 to 2005 and is a Fellow of ASME. Dr. Egrican served as General Secretary of University-Industry Relations Council in Turkey. Dr. Egrican is the President of International Center for Applied Thermodynamics (ICAT)and Scientific Member of International Center for Heat and Mass Transfer(ICHMT).She is the regional editor and past managing editor of International Journal of Applied Thermoydynamics (IJOT). She has organized and chaired many technical conferences. She was the Conference Chair for three current conferences; SOLAR Future 2010, ESDA 2010 and ICAPM 2009 and currently she is organizing ICCHMT 2011. She has mentored 9 PhD students and more then 50 MS students for thesis translated to industry. She has 116 publications related to energy, mostly on solar energy systems.